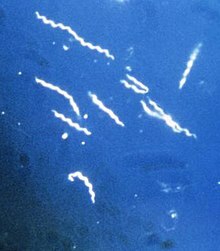 Borrelia afzelii is a species of Borrelia a bacterium that can infect various species of vertebrates and invertebrates. Among 30 Borrelia known species, it is one of four which are likely to infect humans causing a variant of Lyme disease. Coinfection by this Borrelia species with one or more pathogens can occur, carried by the vector, which appears to be in most cases the tick. ^ Bunikis J, Garpmo U, Tsao J, Berglund J, Fish D, Barbour AG (June 2004). "Sequence typing reveals extensive strain diversity of the Lyme borreliosis agents Borrelia burgdorferi in North America and Borrelia afzelii in Europe". Microbiology. 150 (Pt 6): 1741–55. doi:10.1099/mic.0.26944-0. PMID 15184561. Andersson, Martin; Scherman, Kristin; Råberg, Lars (March 2014). "Infection Dynamics of the Tick-Borne Pathogen "Candidatus Neoehrlichia mikurensis" and Coinfections with Borrelia afzelii in Bank Voles in Southern Sweden". American Society for Microbiology. 80 (5): 1645–1649. doi:10.1128/AEM.03469-13. PMC 3957614. PMID 24375128. This Spirochaete-related article is a stub. You can help Wikipedia by expanding it. This page was last edited on 14 October 2018, at 14:15 (UTC).